Missing teeth can also undermine a person’s health and quality of life. Not only can missing teeth compromise eating habits, speech and appearance, it can lead to bone loss in the jaw and the abnormal shifting of the other teeth as well as bite problems. Dr. Field has had great success in replacing missing teeth either with dental implants or with fixed bridges. Using the latest advanced materials and tissue management techniques, Dr. Field is able to provide the service that is most appropriate for you. Dental implants have become the viable treatment option to replace missing teeth whenever possible and are now referred as the “standard of care” for replacing missing or failing teeth. Acting as a substitute tooth root, the natural tissue in the bone bonds to the implant forming a stable foundation for permanent replacement teeth that look, feel, and function like natural teeth. 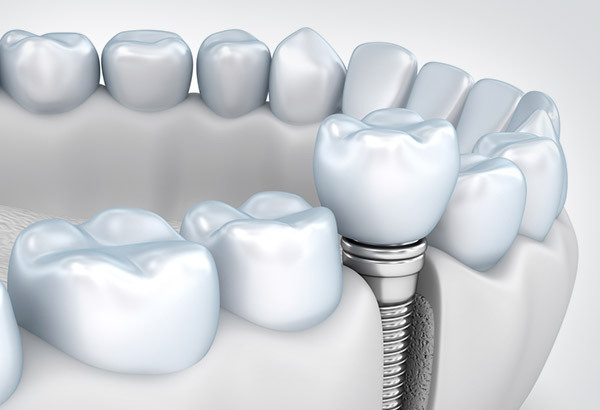 Dental implants actually helps preserve the bone by providing the stimulation that was previously provided by natural tooth roots. This also helps maintain the integrity of facial structures. There are numerous advantages of dental implant treatment over other traditional treatment options. With implants it is not necessary to grind down the adjacent teeth for a bridge, or secure a partial denture to natural adjoining teeth with clasps that can eventually loosen the natural teeth and cause serious damage to the gum line. By utilizing dental implants, people may be spared the many problems associated with traditional false teeth. Conventional bridges are another treatment option when replacing missing teeth. Choosing the best treatment option depends upon the condition of the teeth adjacent to the missing tooth, bone condition, gum appearance, esthetic concerns, prognosis of the restoration, age of the patient, and dexterity.